Sic Bo is a gambling game of Chinese origin. It is also known as Tai Sai or Dai Siu, meaning Big Small. It is played with three standard dice that are shaken in a basket or plastic cup. (Traditionally in Asia, the dice were shaken on a small plate covered with a bowl, which was then lifted to reveal the roll). Sic Bo originated in ancient China and is still a popular Asian casino game. It was brought into the US by Chinese immigrants in the early 20th century. It can be found in most American casinos, and is widely played in casinos in Macau where it is known as Dai Siu. Sic Bo is an ancient Chinese gambling game, whose meaning literally translates as "dice pair"; This is slightly odd, since it is actually played with three standard 6-sided casino dice (the name is actually derived from some of the available bets). 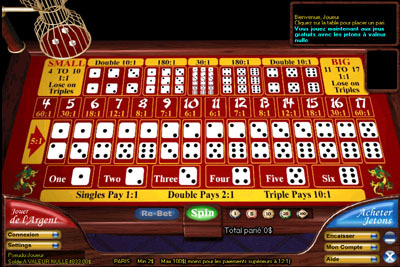 Sic-Bo is very similar to a popular English game known as Grand Hazard and also fairly similar to Big Six in the manner of placing the bets and the odds. Despite its ancient heritage, the game of Sic Bo has only recently enjoyed an upsurge in popularity, possibly in part to its appearance in a number of films. However, it is still one of the less well-known casino games and is often confined to designate rooms for Asian games.